Hello, Happy Sunday and Welcome to the Farm! I hope this past week was wonderful for all of you. Mine was "eh." The new work week was starting and things were fine. Then I started feeling really weird. One minute I'd be freezing and the next minute I'd be completely burning up. People kept telling me I was on the "hot flash track" to menopause (I just turned 50 a couple of weeks ago) and, while this may be true, this WASN'T the "hot flash track." I just didn't feel well. Made it through Wednesday and was feeling pretty good on Thursday...or so I thought. There I was, rockin' my work day and then it hit me. I was sick. Plain and simple...I was sick. Great. Home I went where, here it is Sunday, and I am still not feeling well. I think I feel better because I can get up and around a little, but not for long. Pretty sure that grocery shopping is out of the question. As we all know, not feeling well and having to watch every little move you make so you don't get sick any more than you have to does not mean valuable crafting time. Sucky! Which translates to the fact that all those little fun projects I have lined up are still in line. And they're fighting for who gets to the be the hall monitor, which is stupid considering I don't technically have a hall. It's more of a "space." LOL! To be fair, I'm pretty sure projects really don't know any better so I'm just letting them fight it out on their own. Meanwhile, I was lucky enough to remember one of my favorite projects from a while back (and, by a while back, I mean four years) that I really enjoyed doing. It's one of the ones that I was really pleased with, which doesn't happen that often. I see all this beautiful crafting all around the blogosphere and really wish I had that kind of talent, but I don't. This particular one left me feeling like maybe at some point in time I would be blessed with it! 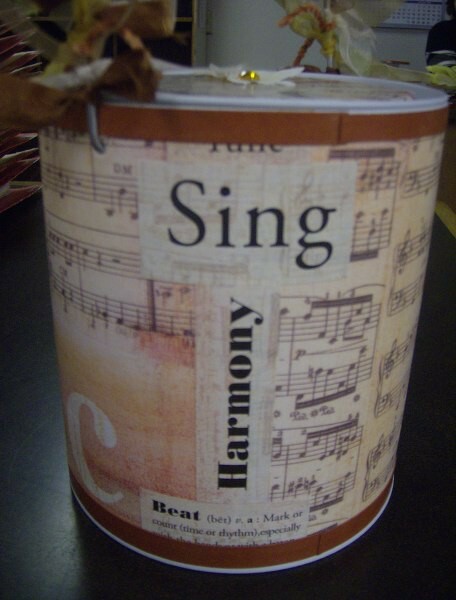 When this project was done, it was at the "paint can high" of crafting. 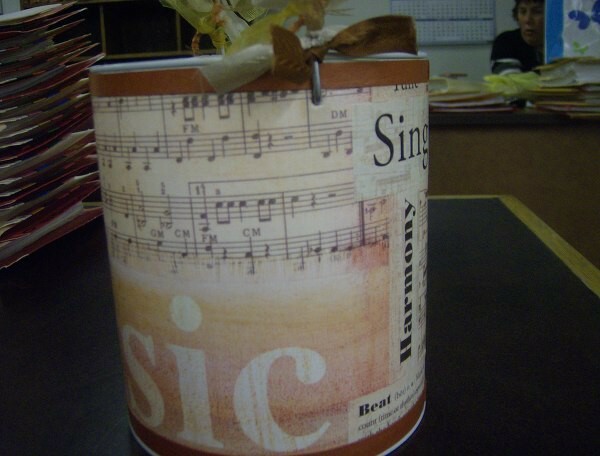 Everyone was getting paint cans to either fill for weddings or birthdays, paint and embellish, or just plain get crafty with. On one of my trips to my favorite scrapbook store which, sadly, is no longer in existence, I found this beautiful paper and knew I had to have it. Whaddya mean what for? Are you crazy? WHO has to have a reason? It was prettiful and that's all I really needed to know. I knew at some point I would find the perfect project for it so of course it somehow made it's way to my little basket. I NEEEEEEDED IT!!! From there, every time I wanted to use it, I couldn't bring myself to do it because then it would be gone and I wouldn't have any left. Come on, quit judging my lack of logic - I know you feel the same way! It was just one of those that I had to have THE perfect project for. Scrapbooking would have had it covered up some and I just couldn't bear that. So I waited...and waited...and waited. Then I moved here, away from all my family and friends and favorite no-longer-existing scrapbook store, which I would visit each and every time I went back until my son so rudely informed me that it was out of business. I cried. Literally. Not only was it my favorite scrapbook store, but my friend owned it and I had spent many, many cropping hours there having so much fun and getting some really awesome ideas from the talented ladies that were there. Oh, they did some beautiful work with their layouts. Someday I really do want to achieve that level of creativity. Anyhoo, I digress. I moved here. And I lived here for about a year and a half before I decided to return. Except it didn't quite go the way I planned and then I returned here. Are you confused yet? Because I SURE AM!!! So, I move back here and get a position where I am working with the most wonderful of ladies. And I truly mean that. There is just no one like them. Loving, kind, accepting, caring...what more could you ask for? If I was going to be in this place without my family and friends, I was lucky enough to have these awesome peeps in my work place. Although I've since moved positions (in the same department) these are still my favorite co-workers of all time. They still care and they still ask me about my life (former and present). Now, one of these ladies just happens to have the most beautiful daughter (next to mine, of course!) who has the biggest heart that I have ever seen. At the time I made this gift, it was for her 18th birthday; she's now 22. Whew, where did the time go? So...this pretty girl that was about to turn 18 at the time just happened to love music. She was in band and she played the oboe. Beautifully, I might add. When I got to know her a little and realized just what a beautiful person, inside and out, that she was, I knew the time had come to use that paper I'd been hanging on to for dear life. 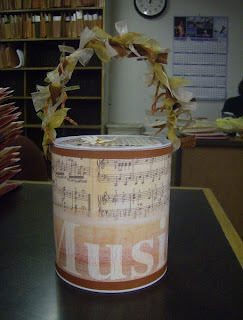 Enter Ashley's music can. I'd love to give you a more exciting and ear-catching name, but I don't have one. Now, before you go getting all hot and bothered that I don't have a really cool name, just remember I'm still unwell. The fact that I've had four years to come up with a name is irrelevant. So I found this paint can at my fave scrapbook store when I went back on one of my visits and knew that I'd be using this fab paper on it. The question was how? I didn't want to mangle the paper; I really wanted the warmness of it to shine as the main focus. Pooh thot and thot...oh wait, that's another story...I thought and thought and came up with the idea you see here. 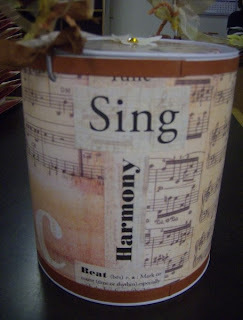 Not only was this my first paint can project, but it was also my first mod podge project, which had me scared to pieces. I could just see this globbed up can turning out so disgustingly icky. But I was patient which, for those of you who know me in person, know is EXTREMELY rare. And by extremely, I mean once I was patient and this might have been that once. Yeah, I just am not known for that particular quality. Before I started, I made sure to wipe all the outside of the paint can, as well as the lid. I did that mainly because I know how I am when I see something; I've got to pick it up and check it out and, since this was my first mod podge project, I really didn't know whether there would be an adhesion problem or not. I am so naive when it comes to that kind of thing. I measured and cut and mod podged my little heart out and worked diligently to make a beautiful project for Ashley's birthday. To finish off the look, I trimmed a piece of card stock and attached it at the bottom and the top rims, more for a covering up of any raw spots than anything. But the pop of color it added really surprised me and I think it really brought out the beautiful warmth of the pattern paper. I even managed to make a card that I actually liked too! I was on a roll that week! Woot! After I had adhered everything with the mod podge and let it dry, I went back over it to seal the paper. I didn't want any ends to start popping up and coming undone. Once everything was dried thoroughly and sealed, I grabbed some ribbon from my stash and started going to town on the handle. That was kind of fun in itself, I must say. I'd never done anything so random and I was really enjoying it. I ended up using several of my leftover odds and ends so not only did I love the look of what I was doing to the handles, but I used up some stash, enabling me to get more stash. Hee hee hee. I KNOW you all know what I'm talking about...getting more stash is important to our daily lives. We NEED it. This is the one and only paint can project I've ever done, mainly because I just don't think I can duplicate the feeling this one has. While you all know I'm not one to toot my own horn loudly, I am really proud of this project and I feel it turned out so beautifully. 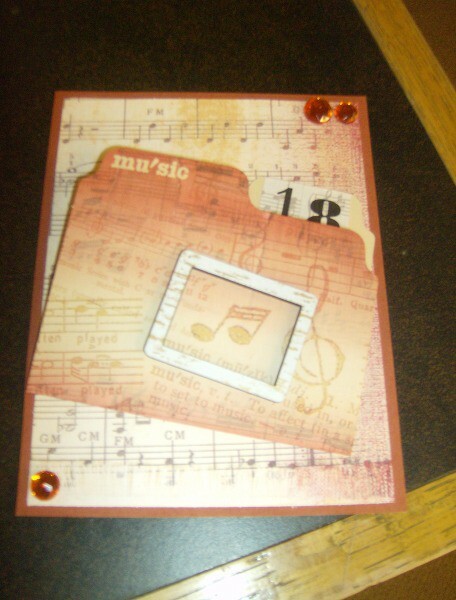 Music Pattern Paper by Creative Imaginations; Jewels by Doodlebug Design; Card Stock (Terra Cotta) by Close to My Heart; Mod Podge Matte-Mat by Plaid Enterprises; Wooden Mini-Frame by unknown source. Hi! 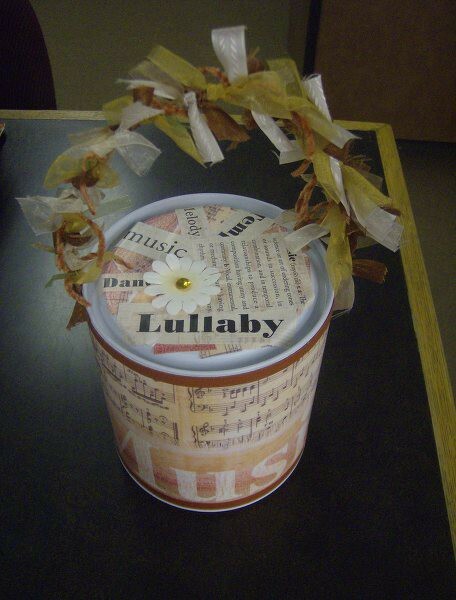 Love this creative project. So cool. Go ahead and blast your own horn! Thanks for coming by to see Denise's Orange Cake. Nice to meet you and we'll see you again soon! Oh, thank you! I'm so glad you like it! Nice to meet you as well! Great looking paint can! It really did show off that paper. Hope you are feeling better by now! What a great story and such a cute paint can. Thx for linking up to Tickled Pink Times Two! What an awesome paint can! I just love the sheet music on it! Thanks a bunch, Jeannie! It is really pretty paper, isn't it? I really want to do another one but I don't think I can match this one. This is such a great idea. Love the theme and all of the paper is just beautiful. Thank you Carmen! It was really fun to do and she loved it. You could put anything inside as a little gift.